“The sight of Elizabeth Taylor or Bosley Crowther or James Cagney standing in line to buy tickets for a movie would be pretty unlikely anywhere, that is, but on Martha’s Vineyard. “On this little Island, about the size of the Isle of Man, and lying a few miles south of Cape Cod, there are four picture theatres — one in swank Edgartown, one in businesslike Vineyard Haven and two in Oak Bluffs, the Island’s only swinging town. Capacity is about 500 in each house. “Reason for the oft star-studded queue-lines is simple. It’s the stern decree of the man who owns all the picture houses (plus some real estate, plus a profitable insurance business, etc.). “And the special Al Hall gen­erator hasn’t been turned off since. “Just before the 1929 crash some­thing inspired him to sell his ex­tensive stock holdings (he could have retired again, if he’d wished) and he started giving off sparks. He got the Stock Exchange office going, modernized the drugstore, then turned to the film business. A short term deal with the owner of the Oak Bluffs houses to buy pictures together left him impatient, so he bought the two Oak Bluffs houses, then the one in Vineyard Haven. “He installed sound as soon as he could in the Edgartown house and ran The Jazz Singer and Rio Rita. “For some reason Rio Rita was a big hit, but never could get a repeat showing, he reflects. “It was lucky he was young and tough because he never knew from one day to the next what he’d be showing, and at what price. He’d leave Edgartown on the 5 a.m. ferry for Woods Hole on Cape Cod, take the train to Boston, rush around making his deals and at the end of the day he’d come back on the train to Woods Hole with his film, plus two wooden boxes with Vitaphone disks and spare, plus the posters. “Not only that, but because the film was inflammable he’d have to sit huddled in the baggage car. 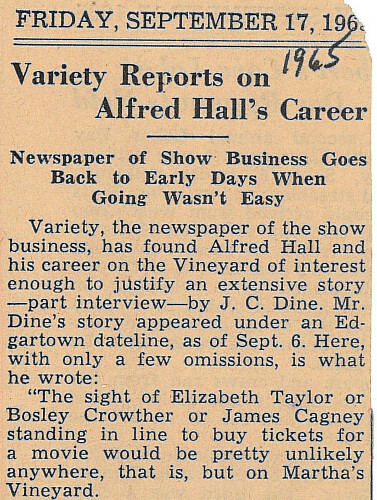 “For a while, these trips were made six days per week, and de­spite the strain, Hall was thriving both personally and financially Soon he’d built enough confidence among the picture people so that they began to come to Martha’s Vineyard to make deals for pictures. “Suddenly the operation became stylish. He became friendly with such people as George Schaeffer of RKO. James Cagney moved to Mar­tha’s Vineyard, bought a house that had belonged to Mrs. Hall’s ancestor, Col. Claghorn, who built the Con­stitution, better know as Old Iron­sides. Cagney became an insurance client of Hall’s. Hall showed Grand Hotel, Dinner at Eight and GWTW — all with reserved seats. “Top executives, such as Seymour Poe, of 20th-Fox began coming to the Vineyard to call on Hall. “Then, he persuaded Somerset Maugham, who was at the time a Vineyard devotee, to hold the world premiere of Moon and Sixpence in Edgartown, and soon that little town, with its white pillar churches, and its stately homes, and tree-bowered winding streets, began to take on the trappings of Hollywood & Vine, much to the ill-disguised bemuse­ment of the summer visitors and the native New Englanders. “A special prep car was hooked onto the now defunct Cape Codder, and the town was soon filled with top New York, Hollywood and British names. A posh private party was held at the Edgartown Yacht Club (and some of the old-timers probably pondered the grave spin­ning that went on among the found­ers who had probably never even spoken to anyone who wasn’t white, Protestant and Anglo-Saxon). “Another Hall memory, albeit a more gentle one, is of the special matinee produced by Katharine Cornell to present a Helen Keller documentary for the benefit of the Martha’s Vineyard Hospital. Tickets were $5, and $2,500 was raised. “Now Hall plays his pictures by concession. Some he can’t get. But he’s more relaxed now. His son Ben ‘I Hall, 30, is taking over the four picture houses. “To get back to the queue lines, Hall claims it’s only sensible that all the audience, regardless of wheth­er it’s Dean Acheson, Garson Kanin, Ruth Gordon, David Merrick, Otis Guernsey, or who, should stand in line.